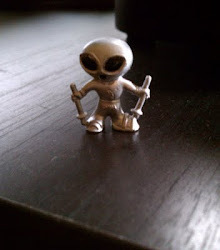 So I now have two UFO sightings to investigate, Cases #XXXXX and #XXXXX, and with any luck I will be able to begin both investigations within the next few days. I have been in contact with one of the witnesses, and hope to interview her in person next week. I have not made contact with the second witness yet, but if he checks his voice mail regularly he'll know I want to talk to him, and soon. As exciting as that is, I still can't help wondering about the ones that got away... namely, the Close Encounter of the Fourth Kind involving creatures who "toyed with" a deer hunter in his hunting stand in Waushara County late last year, and the more recent and more local case that involves that loveable old hairy biped himself, Bigfoot, who apparently lives right here in my home county! The deer hunter case, as fun as it sounds, seems to lead up a blind alley. On the primary data form, the witness only gives his first name, Cxxxx, and the only narrative testimony consists of the simple statement: "They were life forms that trapped me in my deer hunting stand and toyed with me." The only other information on the form indicates that an object was sighted, and that it reflected light, made a noise and affected the witness physically. Pretty slim pickings... But wait! Surely there's more information on Form 7, the "Entity Form." I click on Form 7 and find... nothing. No description of any sort. Cxxxx did not bother to fill in the check marks indicating the number of eyes, noses, mouths and ears the life forms possessed, nor did he indicate whether the eyes glowed. God, I love MUFON Investigation Forms. How many forms do you get to fill out in life that seriously ask you to indicate how many eyes, ears, mouths and noses your new friend has? Not to mention whether the eyes glowed? Anyway, an email was sent to Cxxxx, and it seems to have gone unanswered. Lastly, the case was assigned to MUFON's S.T.A.R. Team, which could be a thrilling development, except for the fact that the hotshots have decided to sit this one out. Still, I need to know more, and the primary data form tells a pretty detailed story. The witness and his/her friend have been seeing a glowing orb hovering over a woodsy, marshy, duck pond-y area pretty much every Saturday night from 8 to 10 pm. Sometimes they watch it from a pickup truck, sometimes they stand outside and watch, and the only time they have tried to approach it, it has vanished. 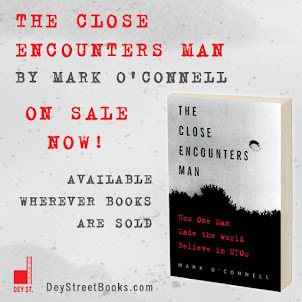 So, ok, it's a "natural phenomenon," according to the boss, but it also happens to have appeared in an area where the two witnesses have been looking for Bigfoot. Maybe I'm too much of a stickler, but is it wrong of me to wonder why these two people have been looking for Bigfoot in this particular woodsy, marshy, duck pond-y area in Jefferson County, Wisconsin? Has Bigfoot been sighted here in the recent past? What information are they privvy to? This is where it gets good. It turns out that the person who submitted the UFO report is part of a "Bigfoot Team." A Bigfoot Team. Right here in my own county. My son Nxxx just asked "How did you not know about this? How did you not start this?" I was nonplussed. How could I have not known? It's embarrassing. 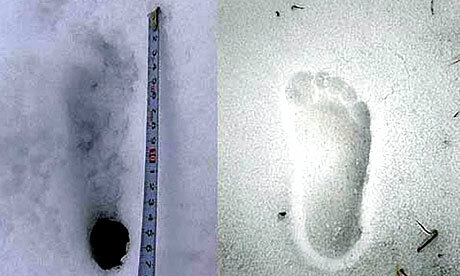 One of the defining characteristics of Bigfoot is that he has large feet, as illustrated here. Anyway, the BT (Bigfoot Team) consists of three people -- possibly neighbors of mine, possibly my kids' teachers, possibly the guy who delivers my mail or the gal who cuts my hair or the guy who works on my car -- who regularly patrol this woodsy, etc., area somewhere within a few miles of where I'm sitting now. And what do they do there, besides mistake natural phenomenon for UFOs for hours at a time? They do what any Bigfoot Team would do: they take plaster castings of huge humanoid footprints they find in the soil, they make note of unnatural manipulation of tree branches, they set up remote surveillance cameras that never work when they want them to, and they leave out bananas. They are also very secretive about their identities and the location of their hunting grounds, and are described as being "very protective" of Bigfoot, which would be touching if it wasn't so damned irritating and selfish. Protective of Bigfoot? Why, if that hairy beast wandered into town it could cause a panic. It might even hurt or kill someone. Protective of Bigfoot? What about the children? I need to get in touch with these people, and I have an idea for how to do it: I could print up nice little signs that say "Psst: I have information about Bigfoot. Call me at 555-555-5555" (that's not my real number, so don't bother to call -- I would use my real number on the real signs), then leave the signs in the banana section of all the produce aisles of all the supermarkets in the county. 'Cause you know who's buying up all the bananas around here.